I have a love-hate relationship with Coetzee’s books. I loved Disgrace, but hated Summertime. I prefer it when he sticks to conventional novels and not when he gets all experimental. It sounds as though this is one of his books I should avoid! Glad that you got to read another Coetzee! It sounds as if this would be an interesting read for me, as I haven’t read many books in this style, and I do enjoy pondering various philosophical ideas. Even though it was very different than Disgrace, I am glad you liked it and that it rewarded your patient reading. Any idea which book you will choose for your next read by Coetzee? Good to hear. It has all the elements to a book that I think I’ll enjoy! @ Jackie: Yes, this is probably one that would drive you bonkers! I don’t think you’d find this one very enjoyable. @ Meghan: I thought Disgrace was in many ways more accessible than this book. The subject matter might be more difficult to take, but the style is more conventional. It’ so SO good! @ claire: I think you would like this a lot! Lots to think about! The whiskey comparison is awesome. I too was surprised when I read Disgrace of how easy it was to read his sentences. I would love to read another book of his, but I’m not sure it’d be Elizabeth Costello. Maybe if the timing is right.. I read this last December, and my review was basically a post on how frustrated I was with the whole thing. I’m glad you liked it–I feel like I would have, but the author-reader contract was broken, I thought. And, well, my review basically turned into a rant, haha. Seriously, our thoughts on this book are so opposite, haha. @ mee: Glad you enjoyed the whiskey simile! It struck me as particularly apt, but perhaps that’s just because I drank quite a bit of it this week… 😉 Although I did enjoy this book, you can see it’s one that I can’t really recommend because it is so unconventional and unlike most fiction. This is a book that really will not broadly appeal, so I leave it to each reader to decided whether this is something that interests him or her. @ Sasha: Yes, I did read your review of Elizabeth Costello and it sounds like you don’t have the relationship with Coetzee that I do! I’ve really loved what I’ve read of his because of how strong he is as a writer. I don’t necessarily mean that this novel is constructed without flaws, but I really love is prose so am willing to follow him anywhere. @Steph: I’d still like to read Coetzee, though–the prose is something one can go back to over and over. I’m thinking of reading Summertime or something when I come across it. I actually do like pseudo-memoirs; it’s the “Oooh, I’m clever” pat-on-the-back aspect of it that irritates me, haha. 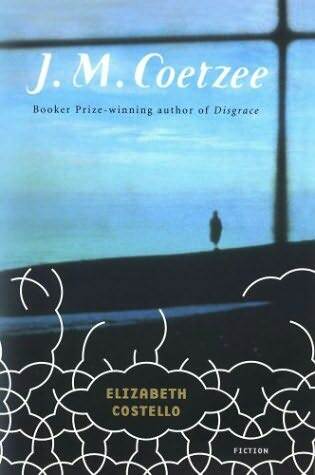 I feel much as Elizabeth Costello’s son does about fiction and its role. This sounds like an incredibly ambitious book, but I’m intrigued. He seems to have pulled it off against all odds. @ Nymeth: Yes, I really connected with the parts of this book that talked about fiction, particularly that line! For me, that’s exactly why I read!